“Look at the way you’re walking, you’re all over the shop!” an 11-year old Jamie-Lee Dwyer heard as she turned to face a rather average, but sandy faced 12 year old boy. 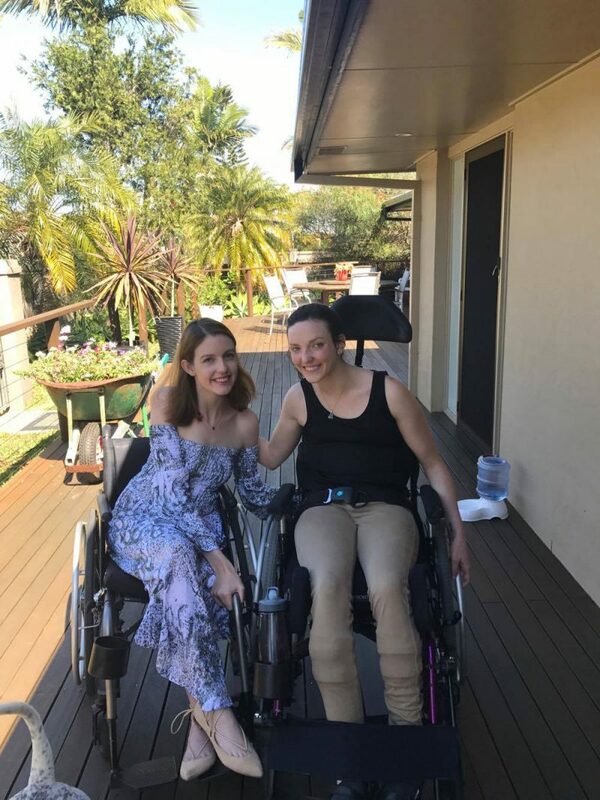 15 years after that playground jibe shook her confidence, Jamie-Lee (26) and sister, Samantha (25) are now role models, sharing their journey with the incurable Friedreich Ataxia Syndrome. 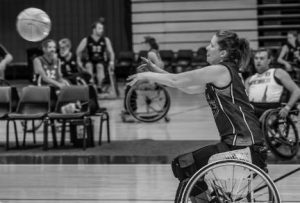 Jamie-Lee was diagnosed as an 11-year old after developing problems with balance, moving into a walking frame at 11 and a full-time wheelchair at 15. Samantha’s story is similar, her body forcing her into a wheelchair at 19. Friedreich Ataxia is a debilitating, life shortening degenerative neuro-muscular disorder most commonly diagnosed between the ages of 5 and 18, leading to the loss of muscle co-ordination, vision impairment, scoliosis, and heart issues. The girls parents, Mike and Mandy Dwyer, both have the defective gene but do not have Friedreich Ataxia. In her blog, Jamie-Lee writes about the humiliation of being a kid with a disability. “I didn’t like being called out on my wonky walk, especially when I felt I needed more time to be a normal kid,” says Jamie-Lee on ‘Acripslife’. “I remember breaking down to my dad one day and him telling me to not let my FA define me. Last weekend, Reading Cinemas at Pacific Fair Shopping Centre hosted the official movie premiere of the new documentary ‘The Ataxian‘. ‘The Ataxian’ follows Kyle Bryant, an athletic and determined Californian man who has the same disease as the girls. Slowly deteriorating, Kyle sets out on a mission to “do something crazy” – resulting in him and his team of four friends taking part in the Race Across America, an annual competition that covers over 4,000 kilometres in just 9 days. The film, directed by Zack Bennett and Kevin Schlanser, takes the audience on an emotional and spiritual journey with days on the open road and conversations with families who have been confronted by the disease. With the main purpose being to educate the world about this disease, the 90 minute film shows that life is about how we react. FA affects only around 1 in every 30,000 people in Australia and New Zealand. Samantha Dwyer, younger sister of the two, hosted both the Brisbane and Gold Coast premieres and attended several of the other events that were scattered across Australia and New Zealand. “I felt I was in the right position to host the event as I am a board member of the Friedreich Ataxia Network and have hosted other fundraisers and events,” Samantha says. “If I could tell a little kid with FA something I would tell them do as much as you can and when you can’t do a thing anymore, figure out a way around it – you can still have a great life. “Seeing that there are other people with Friedreich Ataxia doing incredible things to cure the disease motivates me to keep fighting for a cure and to do everything I can. The girls make living a busy life look way too easy – you would forget they are disabled when hearing their day to day activities. Samantha graduated University in 2014 with a Bachelor of Business and she now owns a social media and marketing business on the Gold Coast. Jamie-Lee graduated in 2015 with a journalism degree and is now a freelance journalist and writer. “We would be lying if we said this disorder didn’t limit our lives somewhat,” Jamie-Lee says. 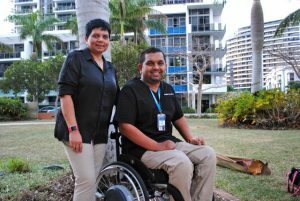 “However, it has also given us both a unique experience and changed our perspective completely regarding disability and neither of us believe that our lives should be defined by our disability. The future is no doubt a scary and uncertain place for both girls with each day bringing new ups and downs. Jamie-Lee is busy running a blog called ‘Acripslife’, which she uses to explain disability to others through humour as well as including the work of her inspiration, Stella Young. 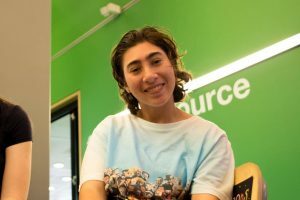 “My future plans are to publish a book about disability, but it is taking a lot longer than I originally thought because my condition keeps changing, so I really have to take it one day at a time,” Jamie-Lee says. “I wanted to write down my experiences with disability and the discrimination I have experienced, I wanted to use humour in the stories to normalise disability and make people realise that just because someone is disabled, it doesn’t mean they can’t live a normal life. Exercise is a vital part of both girls’ lives and this wouldn’t be possible without the help of their personal trainer, Phillip Day. “I used to train both girls however Jamie-Lee recently moved to a care facility in Brisbane so now Sam and I catch up every Wednesday to workout and it’s fair to say they are a little competitive when it comes to doing their personal best,” Mr Day says. They are fighting against doctors’ advice that “there’s nothing that can be done, so try to enjoy what limited time you have with your kids as they will endure a significantly reduced quality of life and it’s unlikely they will live past 20”. Jamie-Lee and Samantha Dwyer are not only role models within the Friedreich Ataxia community but also show how life can be lived and loved to the fullest by everyone.